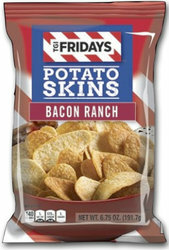 TGI Fridays Potato Skins - Bacon Ranch. Real potatoes seasoned to perfection with a savory bacon and ranch combination. Each 1 oz bag has 140 Calories. Kosher, Gluten Free and No Trans-Fat.